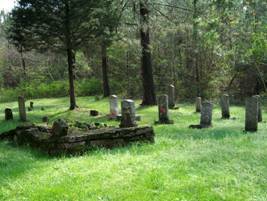 To reach the Bromley Cemetery, travel north on Tennessee Highway 13 for 8 miles. Turn left onto Bromley Rd. (dirt road) at Buffalo River Trail Ride sign and travel 4.6 miles. This is a good road, but may be slightly muddy if it has rained recently. The cemetery is on the left beside the road. This road is dead end, terminating at the trail ride area. The oldest birth date this enumerator found was that of John Smith, being born in the year of 1810. This cemetery was established in the year 1860, according to the marker erected. Bellsha, Billie F.; b. 02 Aug 1874, , d. 26 Feb 1875, son of J.C. & M.C. Bellsha, infant; b. & d. 02 Aug 1873, son of J.C. & M.C. Bellsha, Samuel B.; b. 28 Feb 1887, d. 07 Jun 1897, son of M.F. & B.J. Bromley, Amos H.; b. 10 Dec 1880, d. 13 Oct 1902, son of John J. & Sallie J.
Bromley, Mary J.; b. 27 Sep 1882, d. 07 Jul 1906, daughter of John J. & Sallie J.
Bromley, Mary; b. 25 Dec 1830, d. 05 Jul 1874, wife of John J.
Bromley, Nancy E.; b. 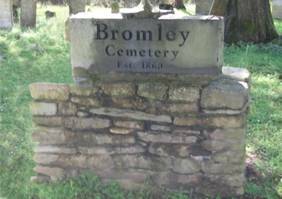 22 Feb 1841, d. 09 Dec 1902, wife of John J.
Bromley, Sallie; b. 08 Nov 1843, d. 04 Feb 1887, wife of John J.
Bromley, Samuel B.; b. 05 Aug 1877, d. 03 Sep 1879, son of John J. & Sallie J.